Have you been looking at your plants and wondering if they could be transplanted to a different location in your garden? With our easy fall transplanting tips, you can decide what should or should not be transplanted based on our suggestions. Of the many garden maintenance tasks you need to attend to this fall, transplanting is one task that may get overlooked but should be added to your maintenance list. The fall season is a great time to divide and transplant, or just transplant, certain plants to different areas. 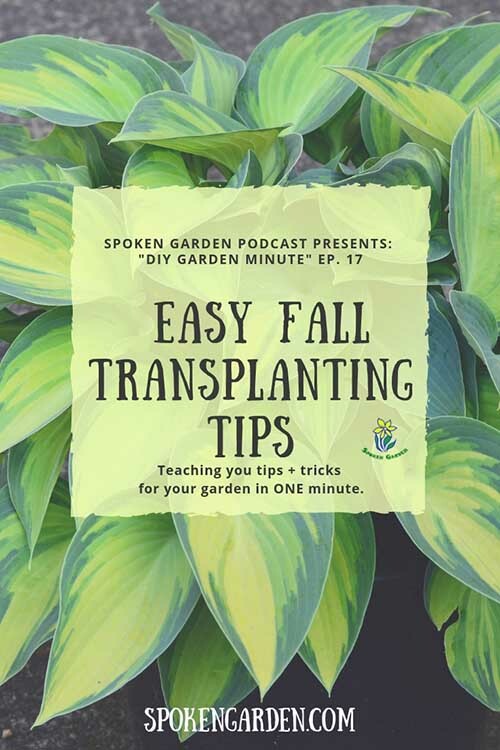 Listen to our quick segment on this "DIY Garden Minute" to learn easy fall transplanting tips with suggestions for how to keep your plants healthy. Our tips and ideas will help you learn how to do it correctly! This episode is for beginner to the more advanced gardeners who want to learn tips and strategies to better transplant their flowers, plants, or shrubs. Click the graphic above to save "Easy Fall Transplanting Tips" to Pinterest for later! Learn best practices for fall transplanting with our suggested tips. Why fall is a great time to transplant certain plants. Tips for how to determine if a plant is capable of transplanting. Ep. 23: Fall Weeding Tips and Effortless Leaf Clean Up! DIY Garden Minute Ep. 6: Fall Perennial Planting Tips Demystified!